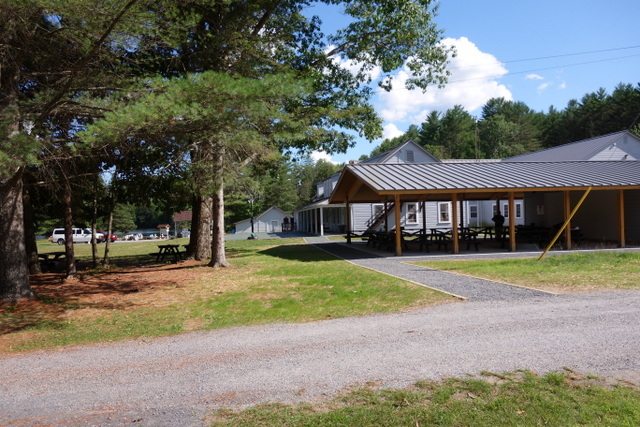 J is away at another sleep-away camp, the New York State Department of Environmental Conservation’s Camp Pack Forest, and she almost was not permitted to stay there due to my Epic Parenting Fail. I’ll explain. This week of summer camp was coordinated with a few friends. The plan was that the girls would feel a bit more comfortable with friends on their first-ever sleep-away camp experience. That was before we found out that J would attend Smirkus Camp earlier in the summer, but whatever, still nice to have friends with you, right? As you might expect, getting the perfect dates is a challenge, and in order to attend camp this week, our family plans required a quick turn-around. The whole family was at the beach in North Carolina last week, we drove home for one very long day on Saturday, and I arrived home and started doing laundry to re-pack J and bring her to camp the following day. So. I tried to organize as much as possible prior to our beach trip. We set aside things that we’d need for camp that wouldn’t be coming to the beach (a sleeping bag, long pants, water shoes) so that we could be pretty efficient. And, really, the quick turn-around wasn’t too bad. One thing that I was a little worried about was making sure I wasn’t missing any paperwork. There had been an email reminder that we’d need a photocopy of both sides of our insurance card. Then one of my friends mentioned the insurance card. Honestly, I was a little stumped on this one, because I could have sworn that I’d uploaded a copy of the card as part of the registration process. I went hunting and realized that I’d uploaded a copy for Smirkus Camp. But luckily that digital copy was on my computer, so I just printed it out. Then, just to be sure, on Saturday night I logged into our online camp account to see if there were any messages or any indications that anything was missing. Nope: all set. J and I drove north for the hour and twenty minutes or so, stopping to meet friends at Martha’s Dandee Creme on our way. Which, by the way, was tasty, but the cones were too large. I am not normally someone who would complain about an oversized ice cream, but the fact that the small was actually a monstrosity had a catastrophic impact on the sprinkle-to-ice-cream ratio. However, I digress. My GPS claimed that it had never heard of our destination, so luckily my glorious friend let us follow her the rest of the way to camp. When we arrived and I heard the general parenting chatter, I realized that all the other parents were clutching not only a copy of the insurance card, but also a healthcare provider form. This was troubling. Then I overheard that some kid had gone home because the family hadn’t brought the appropriate healthcare provider form. This was deeply troubling. I was in line with my friend and starting to break out into a sweat. I told my friend that I was having a mild freak-out. I could have sworn that I’d uploaded this special form. I’d checked online and my account didn’t say anything was missing. My friend said she’d gotten an email reminder. The only reminder I could recall was about the insurance form. At this point my stomach was churning and basically all we could do was wait in line. I was trying to shield J so she wouldn’t begin freaking out, too, and my friend did what she could to distract her as we waited. When I arrived at the check-in table, the health counselor pulled out my little uploaded health packet and I breathed a sigh of relief, until she broke it to me that it was missing the last page, the healthcare provider form with immunizations. Which the camp did not have. Which was required in order for me to leave J at camp. Oh, crap. It was time to call Cute W. He and M had stayed in town for her soccer game. I felt pretty confident that if there were forms that were required I had them, but, then again, I’d felt pretty confident that I had everything I needed two hours earlier, and I was wrong about that, too. I dialed Cute W. . . no service. Because, of course, we were Deep in Nature. I texted and got nothing back. I ran to my friend, who was trying to act all casual about the fact that I kept disappearing, and begged for her phone. This time I got through enough to hear Cute W say, “Hello. . . ? Hello. . . ? I can’t hear you. . . .” And of course at this point he was likely getting a bit concerned, since we were off and away and now our friend was calling and he didn’t know why. Ugh. I tried texting, and that went through. Just to set the scene, at this point J has figured out that something is wrong, I am sweating profusely while clutching the (wholly inadequate) papers that I do have, and the counselors are politely trying to deal with the Problem Parent. So it was the perfect time for my pen to explode. Why, yes, suddenly I realized that the pen that I’d pulled out to write down an email address was leaking all over my hands and thus spotting my friend’s phone, which I’d borrowed. I took a moment to wipe all of my fingers frantically on the back of one of the forms to contain the mess. I’d found out that if we had the correct forms at home, Cute W could scan them and email them to the health counselor. Luckily, Cute W was home and luckily, again, this was the sort of form that I generally attach to a white board with a magnet, and Cute W said that he had them. But I also knew that it was likely that the other camp forms and school forms were hanging there, too, and I was now plagued with doubt and fearful that Cute W’s forms were not actually the correct forms. I tried taking a photo of one of the forms and sending it to him, but the image didn’t go through with the spotty service. Also, Cute W does not usually scan documents, so he had to get that started, and when I texted that he should turn on my computer, I neglected to explain that that was because only my computer had the special scanning software that would make scanning possible. Luckily he’s a smarty-pants and figured it out himself. He emailed the forms. For several minutes there, we were in an agony of suspense. J had gone through all of the check-in procedures, but no one would bring her to her cabin until we got this settled, so all of her friends and their families had gone ahead of her. The health counselor had disappeared to her office to check her email. J and I stood, forlorn, awaiting our fate. Finally, finally, the counselor emerged and told us she had the forms she needed. Crisis over. Incidentally, the forms said clearly at the top “Bring these directly to camp” or something like that. But I’d filled them out weeks ago and stuck them on the white board after the doctor’s visit. I’d had similar forms for her other camp that I was permitted to scan and upload, and in the interim, I’d conflated the two procedures. The bummer is that if I’d had an email reminder that said “Bring the health forms and the copy of the insurance card” instead of just “bring the copy of the insurance card,” I would have looked at the white board and brought the forms. But after a week of vacation and a long drive home from North Carolina, I clearly wasn’t firing on all cylinders. We caught up quickly and soon enough J and her friends were trotting off to the lake for their swim tests. I loaded my sweaty, ink-smeared self into the car for the drive home, thankful that I wasn’t bringing J with me. Whoooooshhhhhh!!! So glad she was able to stay at camp and hope the week is fun for her. Serenity now…..